WEST PALM BEACH, Fla. — Drivers and teams from the International Hot Rod Association (IHRA) divisions around North America have qualified for the Summit World Finals through a series of Summit Team Finals events. 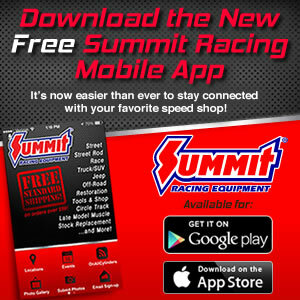 The Summit SuperSeries is held at nearly 100 IHRA-sanctioned tracks throughout North America with more than 8,000 racers competing in the program annually. Any Summit SuperSeries competitor, who has an IHRA membership and an “X” number registered and valid according to IHRA records from May 1 through his or her division’s Summit Team Finals event, that won the Summit Team Finals main event championship are eligible for the Summit SuperSeries World Championship race to be held Oct. 20-22. Maryland International Raceway won the IHRA Division 1 (Patriots) Summit Team Finals held at their home track in Budds Creek, Maryland. Eric Tenney of Capitol Raceway was the Top winner, Tim Foskey from US Dragway captured the Mod trophy and Al Jenkins from Maryland was best amongst the Junior Dragsters. Darlington Dragway won the team championship in the IHRA Division 2 East (Heat Wave) Summit Team Finals held at Carolina Dragway. Two Darlington Dragway racers, Robert Anderson in Top and Devin Smith in Junior Dragsters, won individual titles as did Josh Carroll from Dorchester Dragway in Mod. Memphis International Raceway drivers came away with the title at the IHRA Division 2 West (Heat Wave) Summit Team Finals at their home track. Chad McKee of Middle Tennessee Dragway was the Top champion, Nick Lucas from Knoxville Dragstrip won the Mod race and Andrew Goss from Mo-Kan Dragway was the Junior champion. Empire Dragway edged Quaker City Motorsports Park for the team title at the IHRA Division 3 (North Stars) Summit Team Finals at Keystone Raceway Park. Chris Sanders from I-64 Dragway captured top honors in Top. Dale Eckert from Lancaster Dragway was the Mod winner and Ethan Steding from Thompson Motorsports Park bested the Junior field. Pine Valley Raceway captured the team title at the IHRA Division 4 (Renegades) Summit Team Finals held at the Lufkin, Texas track. Preston Pennington from Edinburg Raceway was the top performer in Top. Drew Porcher from Pine Valley Raceway captured the Mod victory, and Dalton Lummus from Ben Bruce Memorial Airpark was the Junior champion. US 131 Motorsports Park proved to be hard to beat in the IHRA Division 5 (Thunder) Summit Team Finals at its home track. US 131 won the team title and took two individual titles. Kip Burkhardt in Top and Stan Jones Jr. in Mod each won on a holeshot. Luke Schweimer from Grand Bend Motorplex had a solid effort to win in Junior Dragster. Canada’s Team Nitro dominated the IHRA Division 6 (Border Bandits) Summit Team Finals held at Northern Lights Raceway. Rod Belsham was the winner in Box. Andy Closkey led the No Box contingent, while Noah McDonald was the Junior winner. Farmington Dragway won the team championship at the IHRA Division 9 (Raiders) Summit Team Finals at Piedmont Dragway. Jimmy Collins of Farmington Dragway captured the Top victory. Derrick Harris, representing Piedmont Dragway, was the winner in Mod, and Keaton Hudson of Elk Creek Dragway took the Junior crown.